Best Creative Campaigns in March demonstrated that all product categories can make the most of out-of-the-box concepts and create truly memorable and unique campaigns. From popcorn scented bus shelters to superhero costumes, have a look below at the top three Creative Solutions campaigns as voted by the JCDecaux teams around the world. PepsiCo’s world-famous cheesy snack Cheetos, were launching their new brand, Cheetos Popcorn. Cheetos understand the appeal of popcorn; the deliciously sweet smell of the moreish snack. 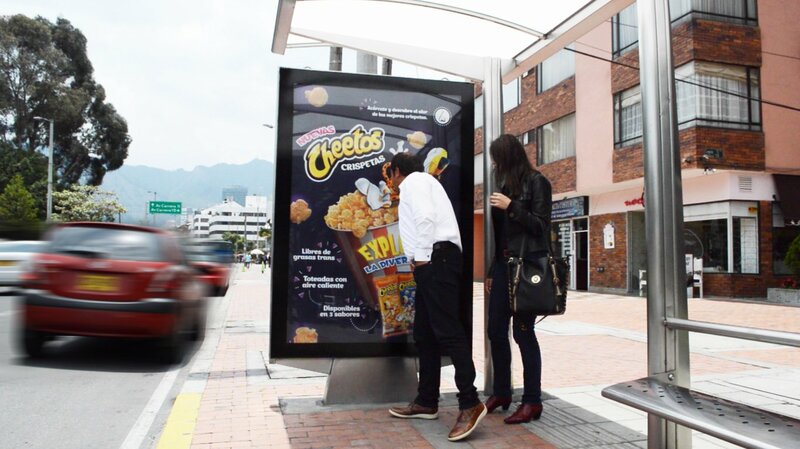 So, to make their bus shelters irresistible, JCDecaux Colombia helped Cheetos by installing scent diffusers inside ten panels. Pedestrians walking past the bus shelters were drawn to the distinctive cheesy popcorn smell surrounding the panels and commuters could contemplate buying the popcorn treat on their way home from work. The campaign was popular because of its universal appeal and simplicity. Cheetos really understood their audience and tapped into their basic senses to leave a memorable and actionable impression. For the hotly anticipated release of Batman V Superman, Warner Bros, Grand Visual and JCDecaux teamed up to make you feel like a hero. Interactive digital screens were installed on the fully wrapped bus shelters. Passers-by could stand in front of the screen and select which superhero they wished to become. Through augmented reality, people saw themselves wearing their costume of choice on the screen. The costume could be resized to fit properly like a superhero costume should! People could then print a photo of themselves wearing their hero’s costume and share it on their social channels. This international campaign was a great success with nearly 9,000 interactions. The stand out design of the panels, especially the one with two life-sized models of Superman and Batman in Denmark, was unmissable. The campaign was universally appealing; from kids to adults who have grown up with the characters. Passers-by were excited to interact with the panel and to be part of the world of superheroes. Omo and JCDecaux Chile picked a high traffic metro station (Baquedano) in Santiago to reach their commuter audience. For one month, the station was fully dominated by Omo; featuring vinyl wraps around columns and an unmissable large panel overhead. You could not miss the giant special build 3D model of Omo laundry powder and the 300 colourful t-shirts surrounding it. The campaign was strategically placed in metro to achieve high-frequency and optimal exposure to the key audience through a simple yet stand-out and memorable execution. JCDecaux Creative solutions create bespoke creative outdoor solutions from concept to on-street reality. Our teams worldwide are dedicated to pushing the boundaries and challenging the conventions of Out-of-Home advertising by delivering outstanding and truly memorable campaigns. Last year, we implemented over 1,600 creative campaigns in over 45 countries worldwide. By using JCDecaux Creative Solutions, clients are able to optimise the impact of their Outdoor campaigns and to maximise the engagement with their target audience. Wish to find out more? Get in touch with our international team to find out the possibilities or discover how JCDecaux’s Creative Solutions add an extra dimension to campaigns to create a truly memorable impression on your audience.